Flashback Wednesdays: "The Ever Evolving Lola Liberty" | Blog | Pixel Toons Ink. 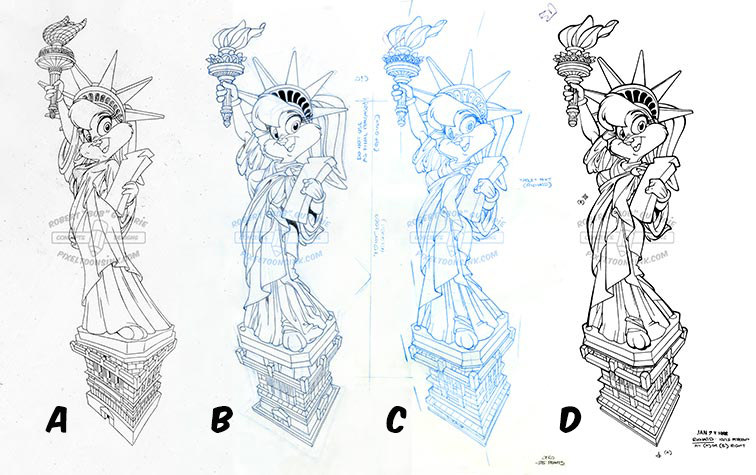 Flashback Wednesdays: "The Ever Evolving Lola Liberty"
Initially, what was a ten minute sketch I did for a friend (A) of Lola Bunny as the Statue of Liberty, was picked up by WBCP management for a “I ❤ NY” T-shirt design for the New York City’s Warner Bros. Studio Store. Management got a last “input” in, when they felt that Lola, look “to much (B) like the Statue of Liberty” (?!). The final design (C), although thinner clothing wise, gave me the chance to actually made her toga more in model to Lady Liberty’s ones, which squeaked by without further management medling (D). A moot point, because when the design was finalized, the N.Y. Warner Bros. Studio Store - along with most of the US stores, closed down and kiled the whole project. Even so, this was one the most fun designs I ever worked for, because it became a fun project to make: a realistic representation of Lola Bunny as Lady Liberty.